ASP.NET Forums/General ASP.NET/Visual Studio and Visual Web Developer Express/vs express web. where is release configuration?! vs express web. where is release configuration?! i just installed visual studio express web and i'm studing. in configuration manager i should have preinstalled release and debug configurations but i have only debug listed. Re: vs express web. where is release configuration?! I can't think of a reason that your Release option wouldn't be there by default (assuming that you just installed Visual Studio 2013 and haven't made any major configuration changes). Do you have any additional information about the current type of application you are running or using? Does this occur on any other applications or just this one? Have you tried restarting Visual Studio or running it as an Administrator (Right-click > Run as Administrator)? i'm running visual studio express for web 2013. it happens even running as administrator. i don't have the package/publish options you're showing. is it possible because express edition is limited?! edit: little update. if i create i project (asp.net empty site) i see the release configuration. if i create new web site (razor) release configuration is missing. The example that I demonstrated above was using Visual Studio 2013 Express. The issue may actually be related to the type of application that you are running. Could you go through the steps that you are taking to build your application (specifically the type of project that it is) as I just created another example as you mentioned (ASP.NET Web Application > Empty) and still had the options for Debug / Release available. If you are explicitly using a Web Site application, you don't really need a Release mode as when it is built all of the files within it will be copied to the server. i think , after creating different kinf of projects, that the feature is just disabled for web sites. I installed VS 2013 express for web, I found there isn’t the Release mode for the website project. I think that is by design. 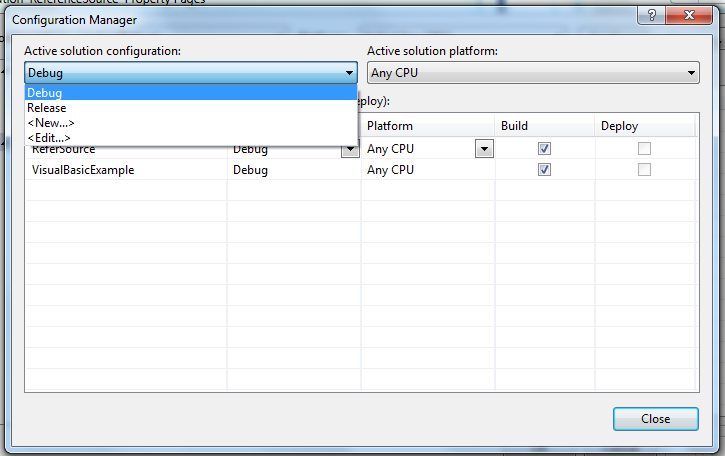 Change the configuration to the Debug mode in the configuration dropdownlist. Repeat the step3, only the web applications’ configuration are changed to the Release, the websites’ configuration are remained Debug. Based on these tests, in my opinion, the Release model is used for the web application project. So, in the VS2013, it isn’t the Release model if we open the website project. As I mentioned in my earlier response (and Starain mentions in hers), Web Sites don't need to differentiate between different builds as they simply will copy all of the files for your Web Site project to the appropriate location when you deploy it (unlike a Web Application which will be compiled into DLL files).